Most of the unhappiness is focused on the movie's cartoon depiction of an allergic reaction. Sam is thwarted by a gauntlet of pointy peanut brittle from accompanying Flint Lockwood in a quest to turn off his planet endangering invention. As Sam lowers Flint with a licorice rope toward the climatic confrontation with his machine gone amok, she receives a cut on her arm from the peanut brittle, causing the left side of her body and her entire face to blow up like a balloon. Initially she doesn't want to leave Flint, but he plummets away after gnawing through the licorice, and she is whisked back to their flying car by another character, where Manny, the camaraman/physician/pilot is waiting with a dose of epinephrine. He injects her leg, she gasps and sits up, then flies away unscathed. Some of the concerns are due alternately to the scariness or humorousness of the allergic reaction. Others are to Sam's inexplicable failure to carry her EpiPen with her and her reluctance to leave Flint to seek treatment. Some moms are worried that kids who watch the movie will want to see an allergic reaction for themselves, and attempt to cause one in a peanut allergic child, which is a truly terrifying thought. Food allergies are serious, and tend to take up a huge amount of brain space for those of us who live with them. In the case of this movie, though, it might be worthwhile to step back and take a look at the bigger picture. Sam's peanut allergy ties into two of the movie's themes: the problematic relationship of consumers to food and the destructiveness of denying one's true nature. The impetus for Flint Lockwood to create his machine, which converts water to food, is the closure of their island's only industry, a sardine cannery. With the movie's typical light touch, the residents of Swallow Falls do not go hungry, rather they are forced to eat sardines, which are "super gross." The success of Flint's machine and his accidental creation of "food weather" allows Swallow Falls, renamed Chew and Swallow, to indulge in a smorgasbord of excesses. Food lying on the ground is whisked away by another of Flint's inventions, the "Out of Sight, Out of Mind-er," which flings the remains to Mt. Leftover, the humongous pile of food behind a virtually unbreakable damn. Unfettered access to candy has some predictable results on the town's children and the gluttonous mayor with his creed of "bigger is better" eats himself to his own destruction. In this context, Sam's anaphylactic reaction is another example of food as a danger to the consumer. Sam and Flint share a common trait in their feeling of being outsiders due to unusual interests. Flint copes by isolating himself in his lab with his monkey Steve (voiced by Neil Patrick Harris) while Sam has chosen to play dumb as a perky intern by hiding her interest in hard science. Shortly after meeting, Flint feigns a peanut allergy to impress Sam, as both characters attempt to impress each other by pretending to be different from their actual selves, who are in fact ideal for each other. Flint's willful blindness to the machine's dangers in his desire to be a hero to his community and Sam's struggle to continue on in their attempt to stop the oncoming food storm despite her reaction to the peanut brittle are both doomed to failure. Only when the two characters accept both their strengths and their weaknesses do they succeed. Sam gives voice to her inner scientist to warn of the impending danger and uses her meteorological expertise to navigate the flying car through the storm. Flint embraces his inventory of wacky inventions to find the tools he needs to turn off the machine and return safely to earth. In a fantastic world of flying cars and food from the sky, Sam's peanut allergy serves as a surprising reality check. After the movie was over I was impressed by the food for thought included in a cartoon which held my six year old spellbound. During the movie itself, I was continually distracted by the damage potential to my highly allergic child of the food falling from the sky. Cheeseburgers? Beef and milk. Drifts of ice cream? More milk. The morning forecast for sunny side up? Eggs. Shrimp larger than a cartoon character's head? Shellfish. That's some serious prawnage! So what did The Kid think of Cloudy With a Chance of Meatballs? "I liked it a lot." What was his favorite part of the movie? "When Steve [the monkey] was chasing the gummi bears around." Was it scary when Sam had an allergic reaction to the peanut brittle? "Don't be silly! It's a movie, so it's make believe, not for real! 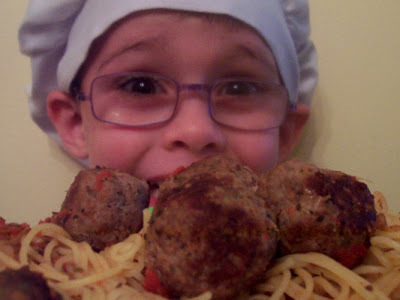 Can we have meatballs for dinner? I want to help!" Absolutely. Thanks for writing up your thoughts. Ever since the peanut reaction scene in "Meet the Robinsons", I dread cartoon portrays of allergic reactions and EpiPens. That one completely freaked my son out -- the reaction, the administration of the EpiPen, everything about it. We got through it and it actually led to some great conversations about a bunch of different topics, but it was quite the thing to get ambushed with! I just gave you an award on my blog. Thanks for all your ideas! Thanks for the review. I had no idea this movie (and Meet the Robinsons) had those portrayals. Wow... I will be interested to see both of these movies.